The MX4 expansion module provides temperature and frequency input capability to the C4/CPC4 generation of FW Murphy Controllers using CAN proprietary communication. Serial RS-232 or RS-485 ports also provide other communication methods to work with any Modbus RTU master device. The MX4 module features 18 thermocouple inputs and 1 magnetic pickup input. The MX4-R2 expansion module provides temperature and frequency input capability to the C5 and future generations of FW Murphy Controllers using CAN proprietary communication with enhanced diagnostics. Serial RS-485 port and 2 Ethernet ports also provide other communication methods to work with any Modbus RTU or Modbus TCP/IP master device. The MX4-R2 module features 18 thermocouple / 9 RTD inputs and 1 magnetic pickup input. MX4-R2 is backward compatible to MX4. The MX5 expansion module provides input/output capability to the C4/CPC4 generation of FW Murphy Controllers using CAN proprietary communications. Serial RS-232 or RS-485 ports also provide other communication methods to work with any Modbus RTU master device. The base MX5 module features 24 Digital inputs, 8 Digital outputs, 10 Analog inputs, and 1 magnetic pickup input. The MX5-A model provides an additional 4 Analog outputs to the base MX5. The MX5-D model offers an additional 8 Digital outputs to the base MX5. The MX5-R2 expansion module provides input/output capability to the C5 generation and future generations of FW Murphy Controllers using CAN proprietary communications with enhanced diagnostics. Serial RS-232 or RS-485 ports and 2 Ethernet ports also provide other communication methods to work with any Modbus RTU or Modbus TCP/IP master device. The MX5-R2 module features 24 Digital inputs, 16 Digital outputs, 10 Analog inputs, 4 Analog outputs, and 1 magnetic pickup input. MX5-R2 is backward compatible all models of the MX5. 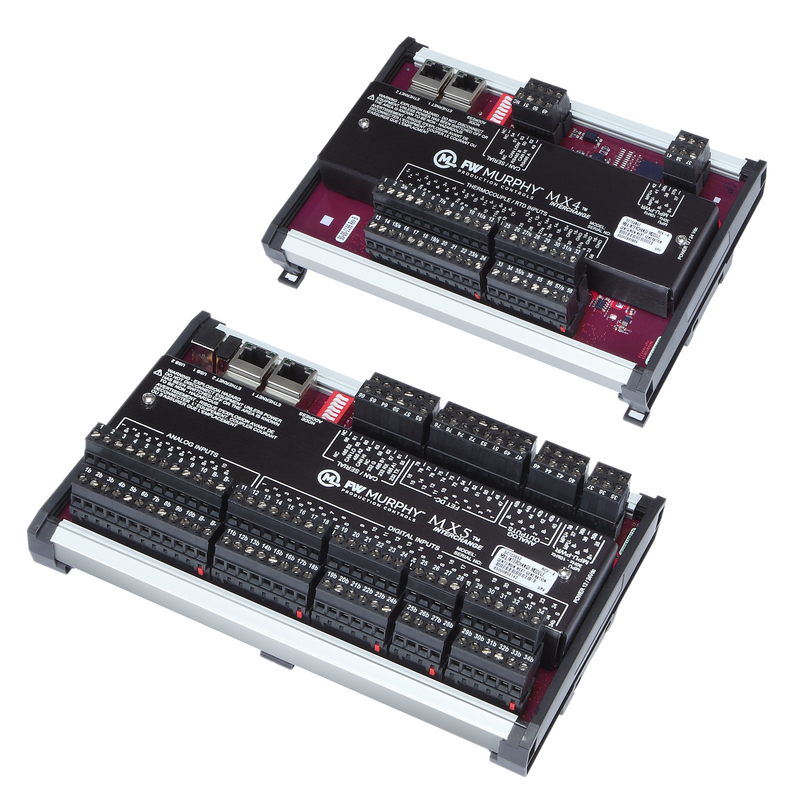 Any mix of MX-Series modules can be added to enable Digital and Analog I/O and Temperature inputs for communication and monitoring by the master controller. Approved Certification for Class 1, Division 2, Groups B, C, & D areas. 10* analog inputs: 0-24 mA or 0-5 VDC, 15 bit hardware. 6 std. config./ 16++* digital outputs: FET (sink). 4 analog outputs: 4-20 mA, 16 bit hardware. * Non-incendive (Digital Inputs, Analog Inputs and Temerature Inputs are intrinsically safe and non-incendive). ++Applies only to Centurion™ Custom and Rockwell Automation® Processor Configurations. *** RTD=Resistive Temperature Device, American RTD Standard, TCR 0.00392, units Ohms/Ohm / deg. between 0-100 C.